New Diamond Plate dog bowls are a heavy weighted bowl with a full rubber bottom to prevent sliding and skidding resulting in reduced noise and spills. The side walls are stamped with a signature diamond plate design giving these bowls a rugged look. 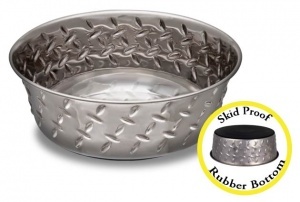 Made from stainless steeel, these extra large dog bowls are dishwasher-safe. Approx Size: 27cm diameter, 9cm height.